The latest figures from Lucas Fox shows that sales in the Spanish capital have risen by 30 per cent in the year to June 2017, with total sales value climbing 170 per cent. Last year, the ‘Real Estate Market Trends in Europe’ report, produced by PwC and the Urban Land Institute put Madrid as the 4th best city in continental Europe for property investment after Berlin, Dublin and Hamburg. Indeed, the National Institute of Statistics shows a 15 per cent rise in Madrid sales in the year to June 2017 compared to the same period in 2016 and transaction numbers are now only 9 per cent below the peak of 2007. Significantly, the volume of sales for Madrid’s prime residential market (homes with a value of above €900,000) showed an annual growth of 27 per cent in 2016, according to the Spanish Department of Development, mainly due to increasing international interest. Domestic buyers remain an important driver of activity, with just under half of Lucas Fox’s buyers coming from Spain. Latin American buyers, though, now account for nearly a third (31 per cent) of all Lucas Fox sales, up from 11 per cent, while the number of US and UK enquiries is “increasing significantly” – up 108 per cent and 57 per cent. Just under two thirds (62 per cent) of Madrid buyers purchased for investment reasons with the remainder (38 per cent) buying as a second residence. Investment is certainly paying off: across Madrid, prices at the end of June 2017 showed an increase of 6 per cent compared to the end of June 2016, but in ultra prime areas such as Salamanca and Chamberí, where demand is higher, prices have increased significantly – up by 10 per cent and 14 per cent respectively, according to the property portal Idealista. Sales of new homes by Lucas Fox’s Madrid office represented 38 per cent of all their sales in the first half of 2017 and the company believes that these turnkey projects will continue to drive the market – particularly in the cities – in the months and years to come. One in three buyers of Madrid property now come from abroad, reveal new figures from Knight Frank, as Spain’s prime comeback attracts international investors. In 2015, the agency reports that Latin American buyers accounted for 30 per cent of all the prime sales agreed by its Madrid sales team. Venezuelan developers are also behind a number of key prime residential developments in the city. Spain’s capital has been back on the radar of both residential and commercial investors for two to three years, notes Knight Frank’s latest report. Nationally, house prices fell 31 per cent on average from peak to trough but Madrid’s prime markets recorded declines closer to 20 per cent. Typical prime prices now range between €5,000 per sq m and €7,000 per sq m.
The key districts of Salamanca, Jerónimos and Chamberí are the most sought-after markets in the city, with wealthy buyers also hunting for homes in El Viso and La Habana. 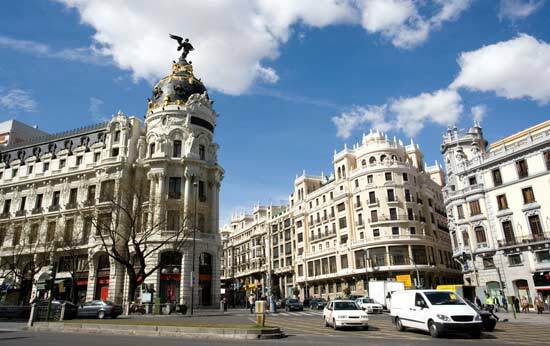 Madrid’s performance highlights Spain’s appeal to overseas investors. The country’s economy has recovered strongly following the Eurozone crisis. In 2016, Spain’s GDP growth (2.6 per cent) is forecast to exceed that of both the UK (1.9 per cent) and Germany (1.5 per cent) and remain well ahead of the Eurozone average over the next three years. Ultra-loose monetary policy by the European Central Bank and low oil prices have led to an increase in consumer spending, higher employment and rising household incomes. The market fundamentals are improving but there remains a backdrop of global uncertainty. Non-EU buyers are now moving in, with Middle Eastern investors active in Marbella – online searches by them on Knight Frank’s website have risen 164 per cent between 2014 and 2015 – and Swiss purchases stepping up purchases in Ibiza. In total the island saw sales increase 37 per cent in the year to 2015. 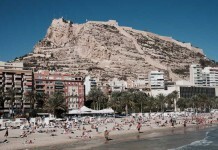 Mallorca also saw a 55 per cent increase in the number of applications for new residential projects in the first two months of 2016 compared with the same period in 2015. Madrid has become a sure bet for buy-to-let investors, as the Spanish city’s property prices decline and rents increase. The capital’s property market has been on its own particular rollercoaster ride of late. In 2015, Knight Frank’s Prime Global Cities Index placed Spain’s capital second in Europe for luxury home price growth. Tinsa went on to report in late 2015 that Madrid had the most liquid market of Spain’s five largest cities, with the average property taking just 6.1 months to sell (much quicker than Valencia’s 14.3 months). But buy-to-let has become the order of the day, rather than capital growth, thanks to a rare combination of falling prices and rising rents. According to the latest report from Kyero.com, home values in Madrid are down 18.35 per cent on the same time last year to a median price of €445,000 in February 2016. At the same time, rents have risen 6.3 per cent in the year to November 2015, according to Fotocasa, positioning Madrid as the second most expensive place to rent in the country. The figures follow Madrid’s high ranking in the Urban Land Institute and PwC’s European real estate investment report for the second year in a row. As the Spanish economy has improved, both institutional and opportunistic investors have flocked to Madrid. The city was Europe’s fifth most active real estate market in the four quarters ending Q3 2015, turning over €5 billion.